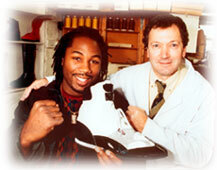 specialist sports footwear from Northamptonshire England. From as far back as the 1970's RB-Footwear can boast a whole host of footwear to its credit made for world Champion fights, both boxing and wrestling. Many of the boots that have been in circulation at clubs and major ringside over the last three decades have most likely been made from the factory here in Northamptonshire. The design team here at RB have manufactured personally for just about every big name in the boxing industry names such as Lennox Lewis, Frank Bruno, Mohammed Ali, Audley Harrison, Dave 'Boy' Green,Nigel Benn, Charlie Magre, Joe Bugner, Alan Minter,Lloyd Honeygan and John 'H' Stacy but to name a few .Throughout the 1970s and 80's boots from RB Footwear were decorated with classic industry names such as Lonsdale, Champ, Title and BBE. Today they now trade under their own recognized logo. Expect a high standard of boot when you purchass from this company and your purchass will of course be hand made by those that have made the boots for history's most famous of heavy weight show downs. RB Footwear has manufactured theatrical footwear for many famous London west end shows and in particular well known movie sets in America. To add to this the company has designed circus footwear, fireproof grand prix racing shoes and footwear for famous pop bands such as the Jam, Take ThaT, The Spice Girls and many others. 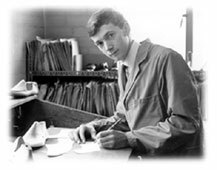 Attending design school for footwear in Northamptonshire England during the 1960's Richard Bishop went on to work for notable county manufactures before breaking out on his own and building his own company with a direction towards specialized sports footwear. Today RB Footwear is a thriving business and an industry known name where notable world champions often drop in time after time.